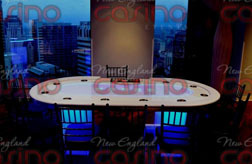 Take one look below and see why we call it “Casino Table Eye Candy”. 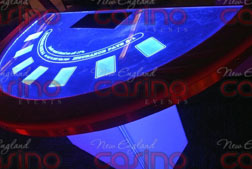 Our all new glow casino tables add an entirely new visual dimension to any casino event and they are guaranteed to wow! These specially designed white frosted tables are back lit with your choice of 16 colors that can flash, fade or synch with music. 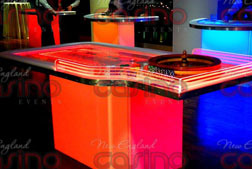 The glow tables make for a chic playing surface that is sure to be the conversation of your event. 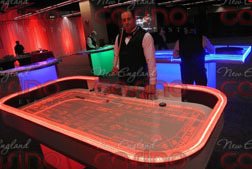 The tables are great for reinforcing company color scheme and make for the perfect centerpiece at any casino event. If you’re tired of the same old casino night, these tables are guaranteed to give your event a facelift. Glow all in and experience the new level in casino gaming!